BEIRUT (CNS) — As the Lebanese army wages an offensive against an Islamic State enclave near the border of Syria, Lebanese civilians — Christian and Muslim — are working side by side, not far from the frontlines, to feed some 5,000 soldiers. The project was spearheaded by Mother Agnes Mariam of the Cross, a Lebanese Carmelite nun who is superior of the Melkite Catholic monastery of St. James the Mutilated in Qara, Syria. The monastery is about 2.5 miles from the battle. When Mother Agnes visited the army compound, she saw that the kitchen was essentially an empty shell. The nun talked to local priests, local Christian associations, Scout groups and organizations such as Caritas and “everybody was very thrilled to help.” They mobilized to equip the space — located about six miles from the frontlines of the battle — with “elementary things” such as refrigerators, stoves, pots, utensils and tables for working. The Lebanese army began its operation in the outskirts of Ras Baalbek and al-Qaa in Lebanon Aug. 19. By Aug. 22, the army said it had recaptured two-thirds of the territory in the area. 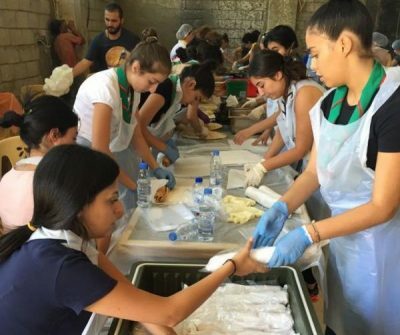 At first people from mostly the villages of Ras Baalbek and al-Qaa came to volunteer, but as word spread of the effort to help feed the Lebanese army, the project mushroomed, and now there are nearly 300 volunteers involved. Businesses are chipping in. Mother Agnes likened the response of solidarity to a “rolling ball,” with new offers of assistance each day from bakeries and supermarkets. “Since the very beginning Muslims asked to participate. And they were very much welcome.” People are coming to volunteer from Shiite villages and Sunni villages, she said. “Everyone works together knowing that the military are also from all the denominations,” she said. Organized in assembly lines, the volunteers — covered in hairnets, aprons and gloves — prepare 5,000 pita bread sandwiches daily, using chicken and beef cooked at the facility, topped with hummus and pickles. The menu also includes fruit and something sweet, like a piece of cake. Just for the chicken sandwiches, the effort requires 1,763 pounds of chicken each day. Battalion trucks load up the meals for delivery to the soldiers. “To see all these people giving their time, sharing their skills, to cook, to organize with very limited means, it is a beautiful expression of solidarity with the army. All religions are unified with the purest love for our country, our wounded country,” said Mother Agnes. Prayers are also being said for the safety of the soldiers and the success of the military mission. “We have been living this battle moment by moment in prayer, in supplication, in hope and in solidarity,” Mother Agnes said. She added that while working, the volunteers pray the rosary, sing Marian hymns as well as the national anthem and patriotic songs. Mother Agnes noted that, as is customary in Lebanon, many Muslims attended Christian schools. “We are praying to holy Mother Mary and they (Muslims) also venerate her, so they don’t mind if we pray our Christian prayers, and they even join in, because, all together, we work and we pray,” she said. Mothers whose sons were killed in previous battles are coming to help “with a lot of joy and hope,” Mother Agnes said. “They give us a very good example,” she said.